Let's go down to the sea, again, and create a crashing, beautiful, ocean scene. 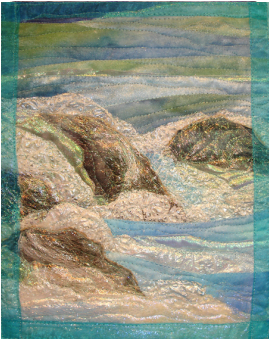 Let's create Water with fabric paints, painted melted cellophane, sheer fabrics and melted fibers; make burnt edge appliqué rocks, and quilt it all with metallic and opalescent threads. Click here for Cool Stuff Resources Guide! I will provide: Pattern, fabric for painting, fabric paints, cellophane, sand, Totally Stable, iridescent cracked ice, Angelina Fiber, MistyFuse, LiquidBeadz, heat guns and woodburning tools, and sheer fabrics as necessary. Materials fee: $20. Note to Workshop Chair: Each student will need at least half a table and access to electricity. We will also need two extra tables for painting, and plastic tarps if necessary to cover tables/rug in the painting area. Rock fabrics, preferably batik or hand dyed. Scraps will do just fine. Be sure to have rocks in shades from light to dark. Preferably NOT pure gray. Transparent sheer metallics – often called opalescent organdie, sparkle organza or silk organza in white transparent or opalescent colors. very fine white iridescent glitter. If you wish to quilt in class, also bring batting and backing for your piece, and some shimmery metallic threads to quilt with.